Sam Allardyce appointed as the new manager. Defender Abdoulaye Faye signed from Stoke City. Midfielder Kevin Nolan signed from Newcastle Utd. Midfielder Matt Taylor signed from Bolton. Defender Joey O'Brien signed from Bolton. Striker John Carew signed on a free. ★ 06th Cardiff City (h). 0-1. 13th Doncaster Rovers (a). 1-0. Nolan. LP:14th. 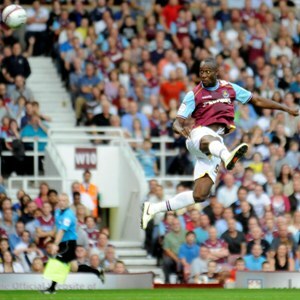 Kevin Nolan scores his first goal for the Hammers! 16th Watford (a). 4-0. Tomkins, O'Brien, Cole, Parker. LP:3rd. "West Ham recorded back-to-back away wins for the first time since November 2007"
★ 20th Leeds United (h). 2-2. Cole, OG. 24th Aldershot Town (h). Carling Cup 1st Rd. 1-1. Stanislas. For the third home game in a row West Ham concede a goal in the final minutes! ★ 27th Nottingham Forest (a). 4-1. OG, Nolan, Cole, Reid. 10th Portsmouth (h). 4-3. Lansbury, Taylor, Noble(p), Cole. LP:4th. 17th Millwall (a). 0-0. LP:5th. 24th Peterborough United (h). 1-0. Noble(p). LP:4th. 27th Ipswich Town (h). 0-1. David Bentley injured and out for rest of the season. Returns to Tottenham. Manuel Almunia signed on a months loan from Arsenal as cover for the injured Robert Green. 01st Crystal Palace (a). 2-2. Nolan, Carew. 15th Blackpool (h). 4-0. Carew, Baldock 2, Collison. LP:2nd. ★ 24th Brighton & Hove Albion (a). 1-0. Nolan. LP:2nd. ✈ 29th Leicester City (h). 3-2. Baldock x2, Faubert. 01st Bristol City (h). 0-0. LP:2nd. 5th Hull City (a). 2-0. Baldock, Collison. 19th Coventry City (a). 2-1. Cole, Piquionne. LP:2nd. ★ 26th Derby County (h). 3-1. Cole, Nolan, Noble(p). 29th Middlesbrough (a). 2-1. Piquionne, Cole. LP:2nd. 03rd Burnley (h). 1-2. Nolan. 17th Barnsley (h). 1-0. Diop. ★ 26th Birmingham City (a). 1-1. Cole. LP:2nd. 31st Derby County (a). 1-2. Nouble. LP:3rd. 02nd Coventry City (h). 1-0. LP:2nd. 07th Sheffield Wednesday (a). FA Cup 3rd. 0-1. 14th Portsmouth (a). 1-0. Noble (p). 31st Ipswich Town (a). 1-5. Collison. LP:1st. The close of the transfer window see West Ham buy... Ricardo Vaz Te, Nicky Maynard and ManU 'bad boy' Ravel Morrison. ★ 04th Millwall (h). 2-1. Cole, Reid. LP:1st. 14th Southampton (h). 1-1. Noble (p). LP:1st. 18th Blackpool (a). 4-1. Tomkins, Maynard, O'Neill, Vaz Te. For the third week in a row Hammers have a man sent off, prompting fans to sing... "10 men, we only need 10 men!" ★ 25th Crystal Palace (h). 0-0. LP:2nd. ★ 26th Liverpool (h). 3-1. Parker, Ba, Cole. ★ 03rd Cardiff City (a). 2-0. Nolan, McCarthy. LP:2nd. Piquionne goes to Doncaster on loan till the end of the season. 06th Watford (h). 1-1. Vaz Te. 10th Doncaster Rovers (h). 1-1. Nolan. LP:2nd. Two disappointing results, joint 2nd with Reading now! 17th Leeds United (a). 1-1. Collins. ★ 20th Middlesbrough (h). 1-1. Faye. LP:3rd. 24th Burnley (a). 2-2. Nolan, Tomkins. 27th Peterborough United (a). 2-0. Vaz Te, O’Neill. LP:3rd. So we win our game in hand, all to do against Reading now! 31st Reading (h). 2-4. Cole, Vaz Te. 07th Barnsley (a). 4-0. 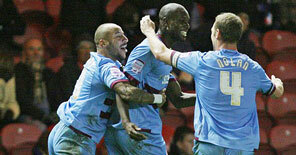 Nolan, Maynard, Noble, Vaz Te. LP:3rd. ★ 09th Birmingham City (h). 3-3. Vaz Te x2 (1xp), Cole. 14th Brighton & Hove Albion (h). 6-0. Vaz Te x3, Nolan, Cole, OG. 17th Bristol City (a). 1-1. Tomkins. LP:3rd. Reading promoted, 5pts behind Southampton... it’s the play-offs! ★ 23rd Leicester City (a). 2-1. Reid, Collison. Southampton lose, West Ham win... 2pts behind! ✈ 28th Hull City (h). 2-1. Cole. LP:3rd. ★ 03rd Cardiff City (a). 2-0. Collison x2. ★ 07th Cardiff City (h). 3-0. Nolan, Vaz Te, Maynard. ★ 19th Blackpool. 2-1. Cole, Vaz Te.